After last weeks recommendations from Bella Union, Slumberland and Cascine we begin this week with the choices of Josh Cohen, the man behind the ever intriguing Memorials of Distinction label. First saw Squid when they played a fundraiser with my all time favourite band Porridge Radio. From that first exposure I was enthralled - Squid’s sound makes it seem like playing in a band is the most fun thing anyone could ever do. It sounds like people figuring it all out as they go along, and this audibly explorative energy has a deeper spiritual resonance than any explicit lyrical meaning could. Both Dana from Porridge Radio and Rafi from Zebrafi/Spinny Nights sent me the debut Great Dad EP, which came out on Bleak Spring in 2017. They have basically no music taste in common, so I went to see Great Dad as soon as I possibly could. I was completely blown away by music that - against all odds - sounds completely original, coupled with an idiosyncratic narrative flair and a hair-raisingly emotive performance. This single captures some, but not quite all, of Great Dad’s brilliance. Hopefully something will do the whole job soon. 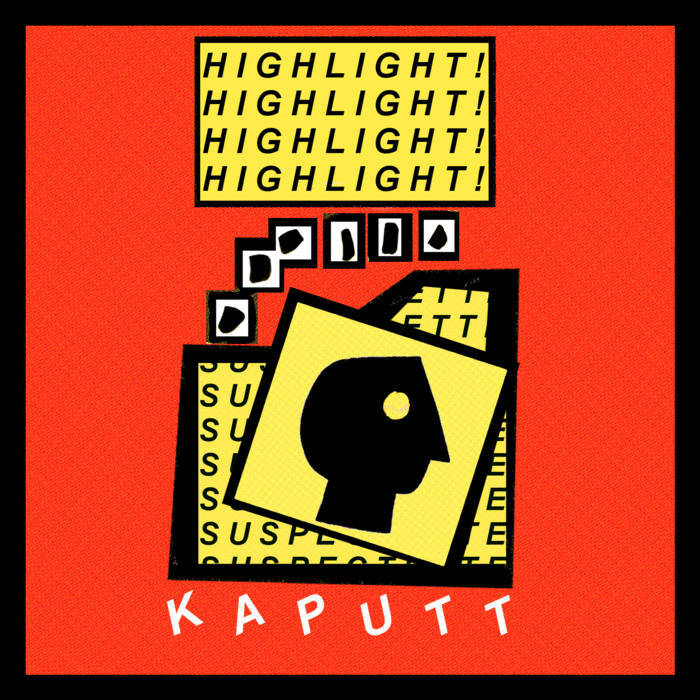 Kaputt played the finale of Porridge Radio’s secret location residency series a couple weeks ago. I saw them again the next day too. They are an incredibly good band, and this single does a much better job of communicating why they are amazing than their demo EP: they make music that is both fun and clever, it sounds like a joke told by somebody who knows some fundamental and essential truths. Go see em live. This is maybe the most perfect song per se which I’ve heard that came out this year. I’m a sucker for acerbic takes on sweet ‘60s pop music, and the combination of cuckholding subject matter and twinkling baroque arrangements send me spinning. Everything is measured and tasteful but at the same time very garish. I can’t quite decide whether it’s seductively evil or comfortingly banal and above-board. Yama Warashi are one of the best bands I’ve seen live in the last year. Again, thanks to Rafi of the Bristol-based Spinny Nights collective, I was made aware of them long before having the opportunity to see them live. I was lucky enough to put on a gig for them this year, and they were incredible and also very sweet. Great, groovy musicianship, an original combination of lovable influences from across the globe, and - maybe best of all - Yoshino’s narration between songs, letting us know what the Japanese lyrics are hiding from our ignorant ears. This track from their new album is a marvellous door in to the complex, breathing world they’ve built. Tirzah’s full length debut is the release that made me feel the most this year. The music and lyrics have resonated with me on a tectonic level, and often shook off the cobwebs covering tender and raw memories I thought were safely archived. I struggle to think of another album that explores the vulnerability of love quite as comprehensively or movingly. I particularly like how (what I would consider to be) the best tracks only start a few songs in - the stage is gently set before the sucker-punches to the mind, heart and body begin. I can’t remember how I stumbled upon Theodor Black’s music - probably while falling aimlessly down some sort of Soundcloud or Instagram hole. He manages to do boom bap hip hop in a way that doesn’t feel overbearingly indebted to the 90s or the US - a testament to the strength of his artistic character. Theodor speaks of feeling depressed and lonely in ways both roundabout and very explicit, but also lots of things on this EP make me smile. It’s a fundamentally enjoyable listen: I couldn’t help but listen to this on repeat for months after finding it. I’m excited to hear what comes next. Isaiah Hull is a poet who published his first book Nosebleeds this year. I don’t read anything, so I don’t know if the book is good, but he made this hip hop EP to prepare the world for it and I almost want to learn to read as a result. Here he positions himself as Manchester’s answer to Earl Sweatshirt. He allows me to revel in a self-absorbed narrative of sadness, suicidal ideation and self-medication, and I can’t thank him enough. Hopefully becoming an official Memorials of Distinction family member soon. I’ve known Soph of Our Girl since my mid-teens, we’ve played in various bands together and I’ve always wanted her to become some kind of guitar icon. This album sounds amazing and her playing is showcased beautifully. Soph’s developed songwriting style is a funny one, she does a lot of things that make obvious sense to me but also a lot of things that don’t, and that element of wrong-footing stops me from being a complacent listener to what is an otherwise quite straight-up-and-down modern indie rock record. I find myself regularly returning to listen again and figure out how it all pieces together. I’m on the edge of my seat to hear how the songwriting continues developing on album two, and I only pray that it involves more shredding. Low’s first album is one of my all time favourites. I have loved a lot of songs from their other albums from the years since, but somehow it’s only their 12th album that I have managed to, again, completely fall in love with the album as an album. It manages to relate to the first album’s signature sparse, mournful sound in a wholly new way, taking the conceptual basics and emotional weight and bringing it into the 21st century. They pulled off their very own 808s and Heartbreaks. I couldn’t be happier to finally say “Yes, I absolutely and completely love the new Low album”.